Tea sandwiches must look as good as they taste. If you’re an afternoon tea aficionado, you know that tea sandwiches must be cut very cleanly; squished sandwiches and ragged edges are simply not the done thing. I took the knife over to her so she could try it out on the six dozen sandwiches she would be making. Knowing she has the dullest knives in town, I gave her the safety schpiel, reminding her that, though a sharp knife truly is a safer knife, it can do some serious damage if she gets distracted. She called me midway through to rave about the knife! But it isn’t just for cutting tea sandwiches. You can use it for anything you’d use a utility knife for and anything you’d use a serrated knife for. Of course, you can’t slice a big loaf of bread with a 5.5-inch blade, but you can slice baguettes and bagels. And Toasted Teacakes! You can make paper-thin slices of tomato and cucumber and cut all kinds of fruits and vegetables. You could even carve a Small Roast Beef. See the giveaway below, which is open to readers everywhere. But first, check out one of my most-requested tea sandwiches. What is your fave? 1 Place eggs in a single layer in pan. Add enough room temperature water to cover eggs completely and an inch over. Bring to a boil over high heat. As soon as water is bubbling lightly, remove pan from the heat and cover tightly with the lid. Let stand for 14 minutes. Drain and add cold water to pan; repeat twice. Leave eggs to cool for 15 minutes in cold water. Drain, and proceed with recipe or refrigerate until ready to use. 2 In a 1-quart bowl, finely chop the hard-cooked eggs. Stir in mayonnaise, mustard, salt, pepper and dill. Taste and adjust seasoning. Divide egg mixture among the lightly buttered “bottom” bread slices; spread evenly, skipping the edges and round part at the top because they are going to be cut away. 3 Put lightly mayo’d “top” bread slices in place. Trim off crusts and cut each sandwich into 4, arranging on a plate in about 3 layers. 4 Lay a high-quality white paper towel on top of the sandwiches. Wet and wring out well another paper towel; lay the damp paper towel on top of the dry paper towel. (Placing the damp paper towel directly on top of the sandwiches would result in soggy sandwiches.) Wrap snugly with plastic wrap; refrigerate for at least an hour or up to several hours. This makes the sandwiches “hold together” and keeps them from drying out. Uncover sandwiches just before serving. I chose the all black knife, but it comes in 7 other beautiful and unique New West color combinations you must check out. The knife comes with a beautiful leather blade protector. This giveaway is open to readers everywhere who are 18 years of age or older. Leave a comment below (one entry per person). Tell me the first thing you'd make with the knife and/or which color you'd choose. Please include your email address in the body of your comment. Must enter by 11:59 p.m. Eastern time Wednesday May 2. Winner will be chosen by random drawing and be announced here in the comments before noon Eastern time on Thursday May 3. If I don't hear back from the winner of the random drawing by noon Eastern time Sunday May 6, another drawing will be held and a new winner selected from the original entrants (those who commented before the giveaway deadline). Disclosure: New West KnifeWorks provided a knife for review purposes and one for the giveaway. The views expressed here are entirely my own. I always tell my readers what I really think! Beautiful knife. I like the Shoshone color. I live alone, so it's small things: small roasts; small challah. I'd use this knife to slice roasts and slicing challah for French toast. I can be reached at elktgm@gmail .com. EL, I love the shosone color, too! Thank you for including your email address in your entry. Those sandwiches look perfectly cut and so delicious! Christine, you really do need this, because I'm sure you like to cut your tea sandwiches perfectly! Angie, thank you. And this giveaway is open to people from all over the world, so ... you're in! Crocodile Dundee here. Yeee-ah, us Ozzies love our knives. Knives, ya know? Not those little olive pickers. Real knives. Now, that one you flashed out today – “that’s a knife!” So, the first thing I would do with it is cut me way out of this crocodile, then maybe dice up some snake hors d’oeuvres. A blue knife would work best, so I could find it quickly in a drawer full of red spiders. Happy tea time to ya! Or tee time, if you’re into golf. Can I be selfish and want to win this knife too. I would definitely use it for cutting tea sandwiches too. Your tea sandwich sounds delicious. You can find me through my blog. "tea sandwiches must be cut very cleanly; squished sandwiches and ragged edges are simply not the done thing. " Well, yes, if you are having tea with the Queen or afternoon tea at Harrods or Fortnum or Masons,Jean. But, as my Mum always says, "Eat your crusts. They will make your hair curly." They didn't make my hair curly, however. I think it was one of those phrases that parents used in WWII to make their offspring eat everything they were given and not waste anything. You are right, of course, for a garden party, Jean. I've always gone by the dictum, rules are there to be broken though. Ha! Ha! I love a good knife and a good tea sandwich, too. I would love the blue color and would use the knife to cut into bagels my hubs loves that have raisins in them..I could finally cut them in good shape and also tiny tiny sammies I make in the summertime to nibble on..oh, my goodness sakes alive..from mjs at mrs.sampson1@outlook.com..happy summer and thanks for such a sweet blog and the giveaway..mjs!!!!!!!!!! Tony, your mum is quite right: Eat your crusts! But a proper afternoon tea or garden party calls for cutting those crusts off (though, truth be told, I often set them aside as I'm cutting the sandwiches and have them as a "cook's treat" with a cup of tea as I relax before the party. MJS, you are welcome. That blue is awfully pretty, isn't it! Hi Jean, Your sandwiches look great and thx for your recipe. I would use this handy knife with the small tri-tip roasts I prepare for John and me. Also, I made a lot of salads for John. Have a lovely day. The first thing I'd slice with the green knife would be a tomato. Then I'd have a BLT sandwich. Or make mini BLT' s on toothpicks for a teaparty. Oh, Mildred, it is perfect for those small cooking-for-two roasts! Hope you and John are having a lovely day, too. Barbara, why'd you have to go and say "BLT" -- now I'm not going to be happen until I have one, and I'm out of bacon! You make best tea sandwich hard to resist them I would of have cup of tea with you and this sandwich. Love it. The egg salad tea sandwiches sound so good, Jean. I've never put dill in mine, but I know I'd like it! I would have to say that I would slice some of my homemade bread with that fabulous knife, and I think I'd choose the red color. Thank you for the opportunity to win! Swathi, I'd love to have you come for tea and sandwiches! I wouldn't even make you bring your exquisite opera cakes! Kitty, if you once make them with dill, you'll never go back! :-) That red knife IS pretty! Hi Jean!Your Tea Sandwiches look really delicious!Great giveaway too!Hugs,have a lovely weekend! Those sandwiches look delicious and so does the bread you used. Thanks for sharing. Your egg and dill sandwiches would be perfect for a royal wedding tea party! 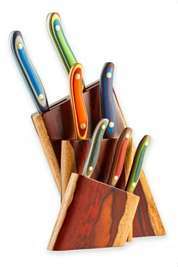 I would love to win the WestKnife (colour: MTN Huckleberry). I'm that friend who doesn't really cook and doesn't have a single knife that can cut anything. HA! Thanks for the opportunity. Oh, Margie, you must have a proper knife for cutting tea sandwiches! If you don't win the giveaway, order one while they're on sale for 25% off. Cool, Nancy! I've thought about it, but I don't know; I'm no good at staying up all night any more! Sunburst, it is. What beautiful knives. I love the Shoshone colored knives. I would love to make a beautiful vegetable salad with these knives! Thank you for such a thoughtful giveaway! I've been admiring these knives for years. They are gorgeous. Thank you for doing the giveaway. Karenann, you're so welcome! And I love that Shoshone color, too! Leslie, I have, too! They are such wonderful knives! These are beautiful knives. I like the Lichen colour. Tea sandwiches are always so pretty and I don't think I've ever eaten one I didn't like. Egg filling is one of my favourites, and smoked salmon with dill, too. My email is lorrieorr @ gmail.com (no spaces). What would I make first? Probably a salad. I prefer cut lettuce over torn, and a sharp knife makes all the difference. I’d choose the red one, and I’d use it on your cucumber sandwiches. I’ve been on a quest for years to figure out how to make them like I’ve Had in tea shops. My search is over, because your recipe is the BEST! I’ve made them five times in the last two weeks. Lorrie, smoked salmon is the one tea sandwich I don't care for. I always ask in advance if they can replace it for me with an extra of one of the others. I sometimes prefer cut lettuce over torn, especially if it's romaine. Ariana, I'm so glad you like my cucumber sandwiches! They're not like any others out there! Tony, I love bread and butter pudding. Here's my recipe - https://www.delightfulrepast.com/2011/04/bread-and-butter-pudding-bread-pudding.html - and I don't cut the crusts off! I adore tea sandwiches but in truth I rarely make them, so I hadn't thought too hard about the hazards of squished bread and oozy fillings! The knife looks beautiful as well as a wonderful tool. It looks like my preferred color would be "cadet" and I think cucumber and cream cheese sandwiches would be first on my list to make. Thank you for the giveaway, Jean. Carol, so far you and I are the only ones choosing basic black! Pauline, now you have me craving a cucumber sandwich! And I have to refer to the chart again, as I can't recall what the color "cadet" is. This knife would be put to good use in my kitchen - and basic black always matches my decor! PS What we do without you? Your tea sandwiches sound delicious and I will certainly be sharing them at one of my tea parties. There is something wonderful about dill, at least I think so. Thank you for that tip on keeping the sandwiches most,I must give that a try. I have their "Chopper" in MTN Huckleberry, so that's my favorite color. Their knives are great (based on the one I have). 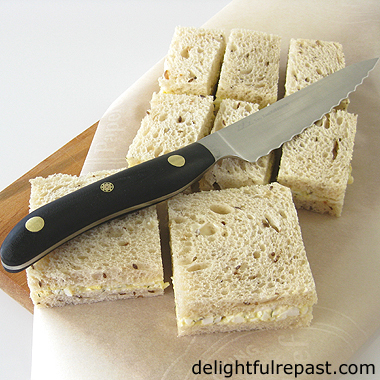 The first thing I'd make is curried chicken salad sandwiches, one of my favorites. Susan, three of us now going for basic black! Debbie, thank you. I think you're going to love my way of keeping the sandwiches moist. When you try it, let me know how it worked for you. Andrew, the chopper looks like a handy one to have! And this one could take care of just about everything else. We own several knives - Santoku, Petty, Chopper, Chef's knife and would love the deli. First dish: Grilled 3 Cheese Sandwich and the Huckleberry color - I love this color! Kathleen, that IS a great color! If you like the petty, you'll definitely like the deli! I'll go with lichen,and it will play with a portobello and spinach sandwich on a multigrain bread from Acme Bread. I love this company. We stopped by their Jackson Hole store last December. The first thing i would make is sliced tomatoes with olive oil, balsamic vinegar, sea salt, pepper and fresh thyme and basil. Love your blog by the way. Sounds like a marvelous knife and the recipe looks delicious. In fact, I might even make your tea sandwiches first. That looks like a good recipe! Manivelle, I'll take one of those sandwiches right this minute! Thank you, Andrew! I might have that very thing this afternoon - minus the fresh thyme, that's the one thing I don't have on hand just now. Jeanie, I hope you like my sandwiches! 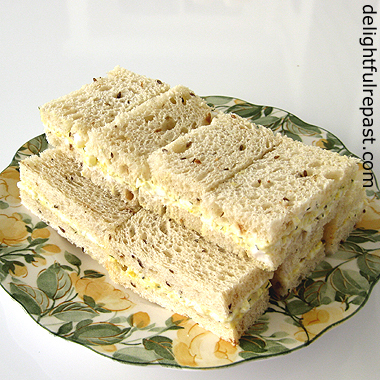 Afternoon Tea parties are my happy place, and I love a good egg salad sandwich. What a great knife for cutting off the crusts. I use your same method of keeping the sandwiches fresh...works every time! I'm guessing I would go with the basic black...although a knife this nice doesn't seem very basic." Thanks so much! Connie, I love "meeting" another afternoon tea fan! This knife is too good to even be simply called a knife; it is a cutting instrument! Todd, ohhh yes - a gin would go just lurvely with cucumber sandwiches! What a pretty knife! It looks perfect for slicing tomatoes or cucumbers, or garlic bread. I'd love the green one. But it's *real* beauty, Rusthawk, is in how beautifully it slices through everything "like buttah!" Those Egg & Dill Tea Sandwiches sound really good! I would love to have that knife in red. Thanks, Susan! Red, it is. OMgravy - what a lovely knife! I must confess that I've never had a fancy knife. Or even, if I'm honest, a very good knife. I love the egg sandwiches the best - our 4 brown hens are busy laying every day so I try not to fall far behind. But we also made quite delicious bacon this year when we butchered our own pigs, so I might first slice a gorgeous hothouse tomato for a BLT sandwich as the inaugural cut of a brand new fan-ceh sharp edge. Mrs Shoes, everyone needs at least one "fan-ceh" knife! You're not the first to mention a BLT, setting off a craving in me, so I see one in my future very soon. The knives are gorgeous! I am currently using a sandwich knife that I picked up at a kitchen store. The handle is plastic and the blade works for spreading mayo or mustard but doesn't cut the bread nicely at all. I end up using my large bread knife to cut my sandwiches. I'd love to make a BAT (bacon, arugula and tomato) on a nice (seedy) bread. This knife looks like a dream to use, not to mention the beautiful wood handle. I think a red one would be fun. Puttermuch, thank you. Sounds like you could definitely use a good knife! The red is very pretty. My homemade hamburger buns, definitely. This knife would be perfect. I don't have a knife like this one and would love to have one. Thanks so much. my email is rrbduncan@gmail.com It would be the best. Rhonda, you're right - when I've gone to the trouble of making homemade hamburger buns, I want to cut them properly! A good knife really make all of the difference! You have me inspired to make tea sandwiches, so I'd make cucumber ranch sandwiches! Thanks, Carlee. Always happy when I can inspire someone to make tea sandwiches or anything to do with tea! Those looks so lovely! Litte tea sandwiches are perfect for Brunch! Thanks for sharing at our Brunch Week Link UP @ celebrate 365 Blog Party! Thanks for your entry, Jan. I hope some of your readers will enter too! I'd have a Cream tea, fruit scones cut with a Shoshone or Huckleberry New West knife. Of course I'd have clotted cream & home made strawberry jam & a great big pot of English breakfast tea - Yum! Jackie, sounds wonderful to me! Like you, I'd choose the black-handled knife. Egg salad is one of my favourites too, but I know a couple of people who are allergic to eggs so another kind I like to make is chickpea salad (I don't really follow a recipe for it). I will ask to keep my name out of the draw, because I have already had the pleasure of winning a draw from you! One of the first blogs I thought of when I began to read again this morning was yours. I wanted to look back to see what you'd posted....lots of treats! My favourite tea sandwich is egg salad, and I love the addition of dill. A good knife is essential and I treasure my Henckell and Wustoff knives equally. ikkinlala, I recently posted my chickpea salad recipe! Though the post might be called Faux Tuna Salad. Anyway ... black handle, it is. Hi Jean! I think I would busy myself cutting vegetables or maybe I'd bake bread just so I could slice it with those groovy knives. I think I could eat ten of those dill tea sandwiches. Honora, that is so kind of you! Sounds like you might be venturing out into the blogosphere again -- will check it out. Karen, "groovy" is a good word for the knives (though my own is basic black!). I could definitely eat ten tea sandwiches--I always get carried away with the sandwiches and tea at afternoon tea. But I leave the sweets alone. I would first use the knife for one of the cream scones I just made, or to slice the tomatoes I keep hacking to pieces, or my favorite lunch of my own rye bread plus dijon plus thin ham plus tomato slices plus onion slices plus pickle slices plus cheddar cheese run under the broiler until it is melted all over, or I would try it thinly slicing frozen chunks of raw ginger - if it did that it would be amazing! And they are so beautiful! sillygirl, now you're making me hungry! Yum, they sound delicious perfect with my tea blends I chose! I can convert these to gluten & lactose free too as I am celiac & lactose intolerant! Lovely having you drop by for our time of tea together. I would get the Peacock colored knife as I feel that bright color would draw the attention of my house guests. It would be a great conversation piece too...and perhaps lead to a few more customers for you. I would put together some footlong sub sandwiches packed with meat, cheese and veggies. I would show my guests how great the knife slices through them. Jennifer, I've developed lots of gluten-free recipes (breads, cakes, scones, etc) for my GF friends. Can't leave them out of my tea parties! Yes, James, these color combinations definitely draw the eye! 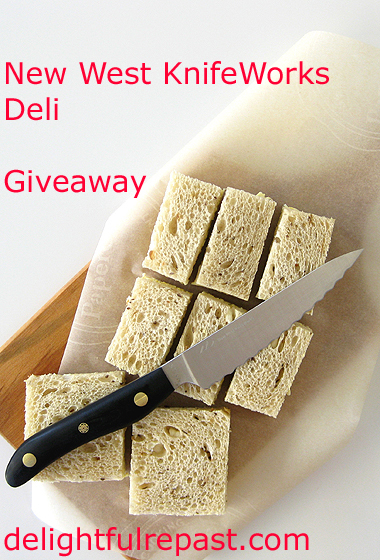 The Deli knife would be perfect for subs. I love the huckleberry, I would make a rubein for sure. Stephanie, sounds good to me! Put the kettle on! Robert, now you're making me hungry -- I haven't had a reuben sandwich in way too long! I've never combined egg and dill. Sounds really great. I want to grow dill this summer in my garden. Tracy, I'm beginning to think I need a red knife, too! Grammy Dee, no worries, I know where to find you! Thank you for sharing this post! Michele, I think you'll really like the combination! I usually grow dill every year. It's really easy and trouble-free. And so much more economical than buying those little plastic packages of it! Everyone should bring back high tea with sandwiches. Found you on Blogging Grandmothers link party. Candy, thank you! I soooo agree. Afternoon tea is a way of life for me, and I highly recommend it. I made your Egg Salad Sandwich today and it is delicious! Hope you are having a great week and thanks so much for sharing your awesome post with Full Plate Thursday! Miz Helen, thank you so much! I'm glad you liked it. Would love the blue one. I’d easily slice through a winderfully crunchy baguette first thing! Linda, you reminded me -- it's been far too long since I had my last bagel! Thank you, Lucy. And I'm always happy to hear from fellow afternoon tea fans! Tea sandwiches can be a pain to cut! You're right -- a good knife makes a huge difference. Great recipe, and great looking knife, too. I think black is definitely the way to go, colorwise. Anyway, fun post -- thanks. Those sandwiches look perfectly cut and so delish! Yummmm! John, thank you. Tea sandwiches, and a lot of other things, are simply ruined by a bad knife. Just like a drink can be ruined by the wrong ice. 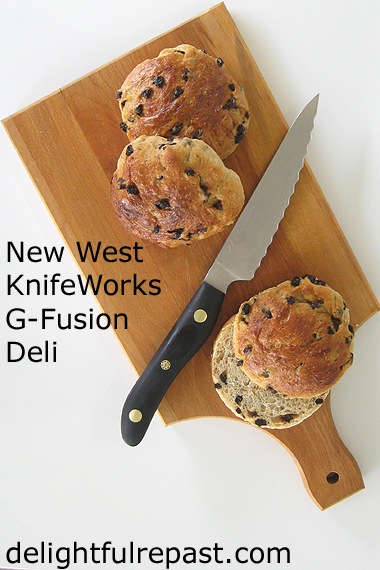 *Giveaway Winner Announced* - The winner of the New West KnifeWorks giveaway, by random drawing, is Margie. Margie, as soon as you send me, delightfulrepast at aol dot com, your color choice and shipping information, New West will ship the package. Congratulations! If I don't hear from the winner of the random drawing by 11:59 am Eastern time Sunday, May 6, another drawing will be held and new winner selected from among the original entrants (those who commented before the giveaway deadline). This was fun! Watch for more giveaways here at Delightful Repast! In the meantime, follow me on Google, Pinterest (@delightfulrepas) and Twitter (@delightfulrepas). You can even use the Follow Me By Email button in the right column. Congratulations Margie!!! What fun to win something and something so beautiful! sillygirl, how kind of you! And I hope one day you'll win one of my giveaways. Do stay tuned, I do them fairly often. Thanks, FLOTR! And I really do think *every*one needs one of these knives! Very kind of you, Rusthawk! That knife looks great and your sandwiches sound amazing. I am hungry now :) Thanks for sharing your post with us at Creative Mondays. Love egg sandwiches. And congrats to the winner of your fab giveaway. Thanks so much for sharing with #TriumphantTales, hope to see you again on Tuesday. Thank you, Claire. I'd love to be having them now, along with tea and scones! Jaki, thank you so much. I know she's going to put that knife to good use.